There was once a time when Pastoturi Glacier was a massive river of ice, but today this glacier in Peru’s Cordillera Blanca is shrinking so quickly that the glacier’s retreat has become a site in itself. 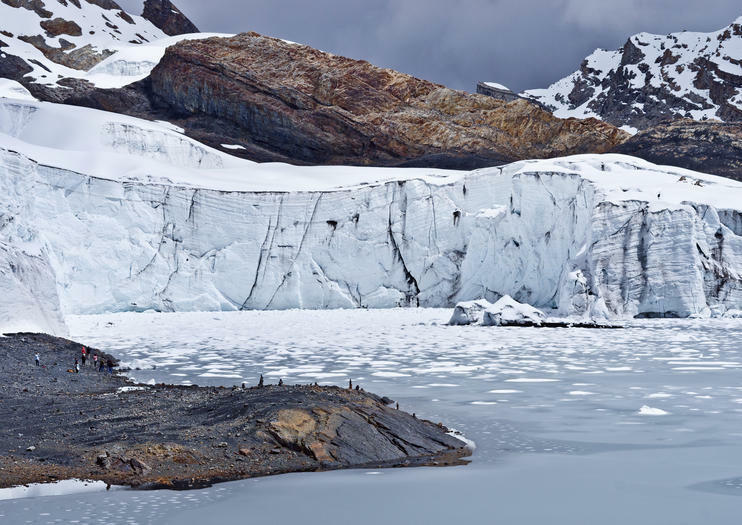 Located in Huascaran National Park, Pastoturi Glacier—despite its demise—continues to offer an exceptionally scenic way to visit the Andes, and has become a spot to view the effects of climate change in action. Shining blue and white against the craggy peaks, the glacier consumes about three square miles of pristine Peruvian countryside, and is one of the world’s most accessible glaciers you can reach by just driving a car. To get an up close view, however, you’ll need to get out and walk, which can take about 30-45 minutes along a weaving walkway. Up here in the mountains it can seem the clouds are right at the tips of your fingers, and the gaping blue sky stretches out like a canvas that rests on the snowcapped peaks. In addition to visiting the glacier itself, tours from Huaraz also stop at sights like shimmering Lake Patococha, and scenic vistas that instantly help you feel the magic of these mountains. Insider's Tip: Chew on coca leaves or coca candy to stave off altitude sickness. Pastoturi Glacier is about 16,500 feet (5,000m) above sea level, so be sure to have spent a couple of days acclimatizing before making the trek to the glacier. Since snow and ice can occur in any season, be sure to pack gear for frigid conditions, as well as boots and a rain jacket. Walk across the great Pastoruri Glacier during this full-day tour from Huaraz. Observe the local wildlife, such as geese, ducks, and other wild birds, at the Patococha Lake and taste the naturally carbonated water that flows underground. Arrive at the ice mountain by horseback or ice hiking to visit the ice lake and ice cave and admire the frozen views of Pastoruri. Visit Pastoruri Glacier on a private tour from Huaraz that explores remote mountain roads, colorful alpine lakes, and the high peaks of the Cordillera Blanca. Traveling with a private guide offers you the flexibility to enjoy the day at your own pace without being limited by a group schedule, so you'll have plenty of time for bird-watching, hiking, or just enjoying the view. Visiting the Huascaran National Park is complete tours around white mountain and the most popular circuits such as Llanganuco Lakes - Chavin de Huantar Pre-Inca Ruins - Pastoruri Glacier and the Puya Raymondi plants, this visit must be and excellent alternative for who are challenging the longets treks and climbings as this could be part of you acclimatizing in the altutudes of Cordillera Blanca, this tour consists three visit consecuently and is arranged since yoru hostel or Hotel in Huaraz.